The Chevrolet Corvette Z06 is already a blazing hot track stud. The Corvette C7.R is already a very fast race car. 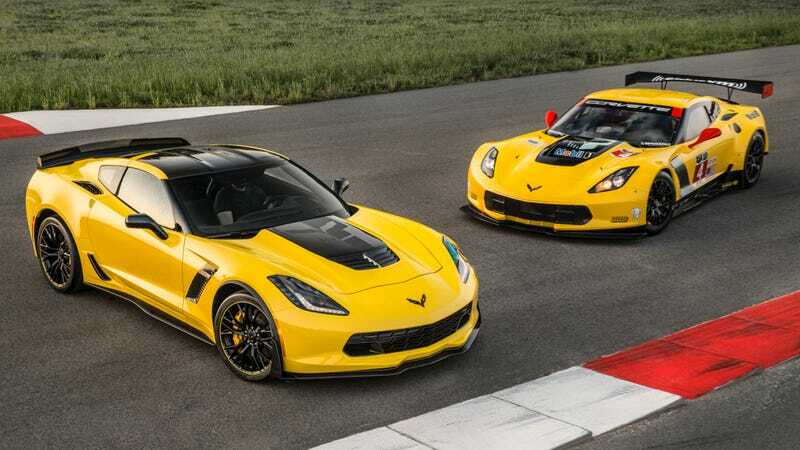 But if you want your Z06 to be just a little bit more like the racer, welcome the Corvette Z06 C7.R edition. It’s like the C7.R in a few ways. But only a few, because the Z06 is much, much more powerful. Seriously, the Z06 puts out 650 horsepower from its supercharged V8 engine. The C7.R, while very, very, very, very, very, extremely fast, only gets 491 horsepower out of the 5.5-liter V8 that’s a carryover from the C6.R program. But part of what makes the C7.R so fast (with class wins at Daytona and Sebring already this year, mind you) isn’t the power. It’s everything else – the aerodynamics, the brakes, and all the added lightness. Also, maybe the stickers on it. So the Z06 C7.R edition takes a little bit of inspiration from that recipe, starting with the full Z07 package to add to your Z06. So you’ll automatically get the huge aero bits, which serve as extra shelving for all the cocaine you’ll need to drive this thing when not in use, and which provide 350 pounds of downforce at 150 MPH. You’ll also get carbon-ceramic brakes made by Brembo, too, to make sure you don’t catch fire after three laps around the track. And there’s no point in stopping if you can’t turn, so Chevy will slap on some Michelin Pilot Sport Cup 2 tires as well. But everything we’ve said only gets you a Z07 package, and doesn’t quite bringing you up to race car driver yet. For that, you’re going to need carbon fiber. And stickers. Obviously. So the hood leaves out a big blotch of the yellow (or available black) paint, so you can see that it’s made out of carbon fiber. Carbon fiber is all over the interior, as well. And to add 10,000 extra horsepower, graphics, graphics galore adorn your chariot. There are graphics on top, and graphics on the hood. Graphics on the included car cover, and graphics on the door sills, and graphics in the form of a numbered plaque inside the car. Let it be known, your special edition Corvette will have **GRAPHICS** befitting a special edition Corvette. Unless you get the convertible Z06, which doesn’t have a proper roof, in which case, no graphics on the roof. But **GRAPHICS** everywhere else. Oh, and it’ll go to 60 MPH in less than three seconds. It’ll definitely do that.